On An Overgrown Path: Is Kylie Minogue really headlining the Proms? Is Kylie Minogue really headlining the Proms? Whether we like it or not brands are now part of classical music. Nowhere has the power of the brand been better exploited than at the BBC where the portfolio includes 'BBC New Generation Artists', 'BBC Young Musician', and, of course, 'BBC Proms'. And as every marketeer knows, brands sometimes need repositioning; which makes the headline above particularly interesting. Traditionally the BBC Proms brand represents a trustworthy source of mainstream classical and adventurous contemporary music; to supplement this in 1996 another brand, 'BBC Proms in the Park', was introduced with the admirable objective of making light classical music accessible to an audience beyond the Albert Hall. Over the years the Proms in the Park have been repositioned from 'light classical to 'light entertainment' - last year Westlife headlined the Hyde Park event, and this year, to the delight of the media, it is Kylie Minogue. So far so good: 'Proms in the Park' is a separate brand so there is no repositioning of the core BBC Proms property. Or is there? The Sun's 'showbiz' front page seen above has Kylie "at the Proms". OK, the Sun is a Murdoch rag not noted for its journalistic quality, so cut to the screen grab below from the current front page of the BBC News website. Again Kylie is lined up for a "Proms concert"; semantic hairsplitting perhaps, but this is the "official" source. 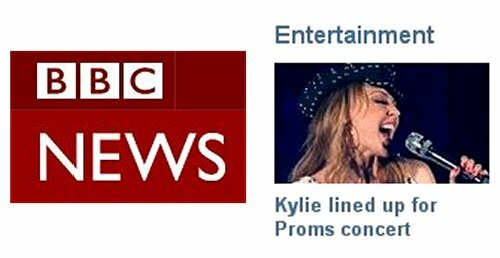 It is not a space dictated abbreviation as "Kylie lined up for Prom in the Park" fits the available space. Is it carelessness by a BBC web editor? - quite possibly. Or could it be nuanced repositioning of the Proms brand? Now let's make one thing clear at this point, I have no problem with Kylie playing a Prom in the Park. I am among what I suspect is the small number of Overgrown Path readers who have seen her live - NEC Glasgow 1988 - and very good she was too. And let's not forget classical music's silly conventions have been robustly challenged on this blog. But I am concerned about backdoor repositioning of the Proms brand. Yes, these headlines raise awareness of the main Proms. But when Sun readers buy tickets for an Albert Hall Prom will they expect Kylie-style music? And will the BBC respond by giving them Kylie-style music at the expense of mainstream classical because, to quote the mantra of our times, "that is what the audience wants"? - remember we already have musicals in the main season. Is the repositioning of the core BBC Proms brand inevitable and irreversible? Are these headlines really premonitions? Will Kylie next be headlining the BBC Proms, but not in the park? Answers please by post written on programmes from the 1970 Prom featuring Robert Wyatt and Soft Machine.